the Buckaroos, most recently December 1 and 2 when he and Owens dueted on four songs: "Above and Beyond,"
Varnell ever learned the words to. "I was raised watching shows like 'Hee Haw' and 'The Porter Wagoner Show,'"
was very excited when I saw him wearing it on two album covers: 'Together Again' and 'On the Bandstand' from 1963." up and perform a song with the Buckaroos. Highway Patrol Officer Mack Wimbish, who arranged for the boys to go on a ride-along in a Highway Patrol cruiser. partner and close friend who died in a motorcycle accident in 1974. "He's buried right beside Buck's mom and dad,"
was over. And there stood Yoakam. "He was kind of hiding behind the door, trying not to be seen by everybody,"
talk about Buck Owens and do a couple of Buck Owens songs," Varnell said, "and I'll always do so wherever I sing." Real country music is a dying art form. but Russell Varnell does not consider them “real” country. Owens, Loretta Lynn, Roy Clark and Merle Haggard rather than what is on modern radio, he said. 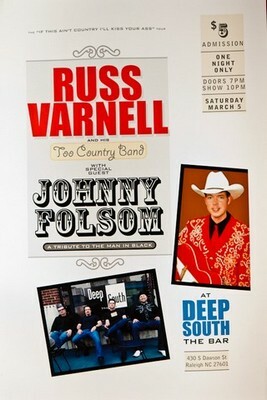 legends, up-and-coming artists and his own group, Russ Varnell and His Too Country Band. ago that was popular with audiences. People seem to like the new one even more, Smith said. However, Varnell doesn’t want people to think of his show as just about old country music. artists that are performing it,” Varnell said. and the crowd was into all the above. Local musician Russ Varnell is sharing his passion for country music on WHIG-TV of Rocky Mount and on the Internet. Varnell loves what he calls "real country music," and the name of his band reflects that. "People said to me all the time, 'Y'all are great, but you're too country,'" Varnell said. Hence, the name of Varnell's band was born. Varnell thinks that some of what is generally classified as "country music" is not "real country music." Watson and Elizabeth Cook as "real country" musicians. 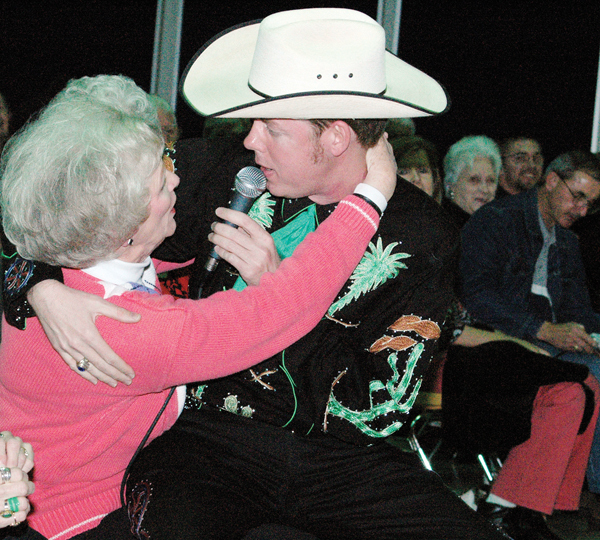 Varnell himself is no stranger to country music. real country music. Country radio is so limited; they only want to play a few (artists)." take full advantage of that ability. occasionally through the last three years, and I saw the broadcasting on the Internet and the feedback from different states." (artists) or helping people remember an artist they'd forgotten about." The job does not come without its challenges, however. The hurdles have been worth it, however, and the response from local and out-of-state viewers has been positive, he said. and several local viewers as well." "Russ Varnell Real Music Show" airs Sundays at 3 p.m. and Mondays at 11 p.m. on WHIG-TV and whigtv.com. The show is on Channel 17, Channel 19, or Channel 33 if you have Sudden Link, Time Warner or UHF, respectively. For more information, go to russvarnell.com or visit his myspace page. WHIG-TV for airing the show. AND HE ALSO DESERVES A GUEST APPEARANCE ON THE GRAND OLE OPRY. Me Back Home," "There Goes My Everything" and "You Never Called Me By My Name." He won a cash prize as well as a trophy. You can see Varnell Nov. 16 at Black Creek Heritage Day Festival. He and the Lost Highway Band will be opening act for The Derailers. You can also check out Varnell on his new Web site: www.russvarnell.com or on his weekly television show, "The Russ Varnell Show"
on WHIG-TV in Rocky Mount every Sunday at 3 p.m. and Monday at 10 p.m.
its backdrop a display of Varnell's collection of country music-style suits. for the first time, at Fountain General Store. Ed Brown; two Scully suits; and reproductions of suits made famous in performances and by Porter Wagoner and Hank Williams. museum after learning that it had, in fact, been stolen from him backstage at a concert in the early 1960s. suit he recently picked up in Nashville. the special exhibit of Varnell's collection of classic country music wear, from 1-3 p.m., is free. Country singer Russ Varnell has gone international. Belgium. In fact, a radio station has selected the music as "album of the week." Varnell gets quite a few inquiries from disc jockeys across the country about his CD, which was recorded in Elm City. They read about it on his Web site, www.russvarnell.com. "Two were a little bit different from the rest," Varnell said. "One was from Australia and the other from Belgium." Varnell sent each DJ a copy of his CD. me that my CD is some of the most requested music on his station." Joris, who has a radio show "Country Club," sent a copy of his radio show to Varnell. and anywhere else there is someone playing country music." To read this entire article and other related stories, visit The Online Edition at the following URL. Country singer Russ Varnell of Wilson has returned from Nashville, Tenn., where he was made a member of Reunion of Professional Entertainers Organization. ROPE includes country music legends as members as well as up and coming country singers. Varnell, along Roger Gilmore, longtime drummer of Varnell's Too Country Band, attended the 22nd annual Rope Awards Show in Nashville Oct. 8. They met and socialized with a number of music legends such as Kitty Wells, Bill Anderson, Little Jimmy Dickens, George Hamilton IV , Stan Hitchcock and more. "This is really an honor, and Roger Gilmore and I really had a great time attending this great event," Varnell said. Varnell and his band will perform at Louisburg Senior Center Friday, at Black Creek Heritage Day Saturday at 10 a.m. and at the State Fair Monday.You can also watch Varnell & His Too Country Band Each Week on Varnell's TV/Internet Show "The Russ Varnell Real Country Music TV Show" Broadcast each week on WHIGTV & WHIGTV.COM. I am preparing myself for a treat come the evening of Aug. 28.
that’s where you need to be, too. discovered the suit, known as the “Watermelon Suit,” was once worn by Owens. The “Watermelon Suit” is on display at Owens’ Crystal Palace in Bakersfield. As good as Russ looks in his rhinestone-encrusted suits, he sings even better. he could, playing them again and again. Russ covers songs by Merle Haggard, Ernest Tubb and, of course, Hank Williams. drummer for Lynyrd Skynyrd when the band lost several members in a plane crash. was around when they were written and performed. Don’t take my word for it. a person. You will get more than your money’s worth. performs and I am there to enjoy it. soundslike a croaking frog with a Southern accent. Downeast Gospel Trio, Ronnie Ezzell, Alvin Smith as Elvis, Russ Varnell and several more. Russ Varnell is just back from Nashville, Tenn., where he performed on “Larry’s Country Diner,” weekly television show on the nationwide network RFD-TV. The show will air March 15 at 8 p.m. Varnell said RFD-TV is Channel 1359 on Time Warner and 231 Dish Network. Varnell had met the owner and creator of the show last year and gave his press information to him, and he got the call recently to go to Nashville. “After overcoming a few scheduling conflicts, I went running to Nashville as hard as I could go.” Varnell performed some original tunes as well as some country standards. Guitar and Grand Ole Opry legend Jimmy Capps and his wife, Michelle, backed him up on the show. “What a complete thrill it was to do this show. I’ve watched it every week on TV since its first episode about three years ago,” he said. “I never dreamed I’d be a guest on it.” While there, Varnell said he was approached about making more appearances on RFD-TV shows later this year. “I will, without a doubt, be happy to go back today or tonight or tomorrow and whenever they ask me too,” he said. “It couldn’t have gone better and what a nice group of folks that treated me so nice.” Varnell said his dressing room was between music legend Gene Watson and Mark Chestnutt and Red Stegall. “I actually got to hang out with them during the day, and even got to play air hockey with Mark Chestnutt while waiting to tape the show,” Varnell said. You can see Russ Varnell and his band in town Friday at the Black Creek Community Building. The 7:30 p.m. nine-year anniversary show will also feature The Malpass Brothers.